For the Miami Hurricanes, it looks like they're embracing the motto of "a win is a win." 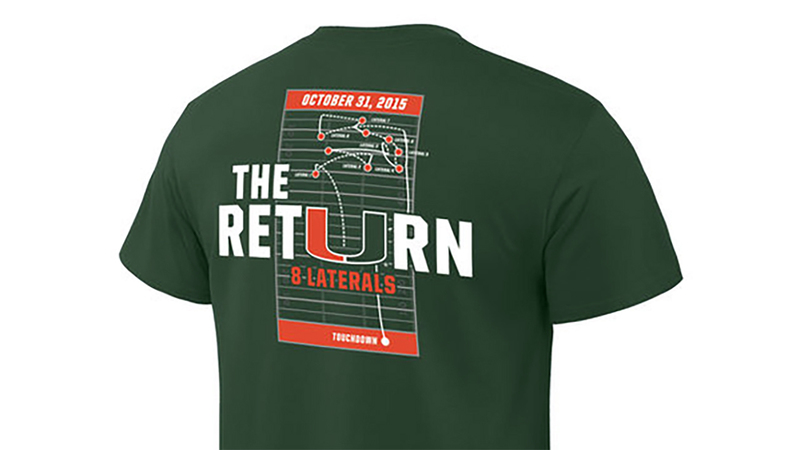 Despite the candid response on Sunday from the Atlantic Coast Conference about the officiating on the final play of Saturday's game at Duke, Miami tweeted out that they are selling a commemorative t-shirt. The Hurricanes are selling the shirt for $24.95 and many Duke fans shared their reactions on Twitter. The controversial call was the final play of the game where Miami scored a touchdown on a kickoff return in dramatic fashion. A penalty flag was thrown on the play for a block in the back, but after around ten minutes of discussion the call was changed and the result was a game-winning Miami touchdown. Along with Sunday's statement from the ACC which included four detailed bullet points on what the officials did wrong, they suspended the entire crew for two games. The suspensions and the ACC's reaction have sparked a national discussion on college football officiating and whether Duke should be awarded the victory. Duke coach David Cutcliffe said that there should be a process in place for results to be overturned in games with similar circumstances, according to USA Today. "What instant replay is in place for is to get it right," Cutcliffe said on a teleconference. "And we did not get it right." Sports Illustrated reported Sunday that the NCAA is considering moving towards a central replay system, similar to the one used in the NFL. Fans on ABC11's Facebook page expressed their opinion as well. One viewer said, "If you're going to suspend the referees you have to overturn the outcome and give the win back to Duke. Suspending the referees clearly admits they screwed it up big time." Another said in a show of good sportsmanship, "This game has a very important effect on the winner of the Coastal.....should be overturned. Sign me: a Wolfpack fan (Atlantic Div)"
The Miami Hurricanes tweeted out a simple response of a shrug in response to Sunday's statement from the ACC. Duke University has not released any official statement on the outcome of the game.